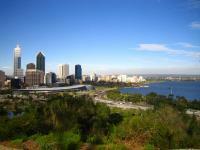 Blog from Perth, Western Australia | Kat's Worldly Travels! Well hi all.... my last week in this amazingly huge country and i feel like i've really done most of it!!! i've had a wonderful experience - and many of them - here an can't quite believe its all coming to an end before i move on to Hong Kong. we have spent a month travelling along the West coast of Aus both north as far as exmouth and south as far as Albany. we seen many good sites including the dolphins at monkey mia, margaret river, the caves, rottinest island and of course perth city iself. hopefully my blog has given you all an insight of what i;ve been up to and what sites i';ve seen. I fly to Hong Kong on Monday and really feel like i'm on my way back home. still have a good month left though so not wishing time away in the slightest, maybe i'm starting to real back the clock and wish i was just setting out on my epic journey!!! however i have the best to come with my trans sib train where i will see and learn about the wonderful cultures in China, Russia and Mongolia. will try to keep my photos coming but cannot say when i will be in front of a screen again. sadly Jon is flying home on monday too but i will be joined by dad in Beijing..or somewhere along the way!! !